﻿ Mandila Beach Hotel DaNang, Da Nang | FROM $56 - SAVE ON AGODA! "The hotel is very nice, great view of the Sea, room on front..."
Have a question for Mandila Beach Hotel DaNang? "It has an incredible view of the beach located right in front of rows of restaurants both opposite of the road and also the same stretch and behind the hotel." "Staff is very helpful and nice and recommend many good awesome food in Da Nang." "Good location, new built hotel, near beach." Offering quality accommodations in the beaches, sightseeing, family fun district of Da Nang, Mandila Beach Hotel DaNang is a popular pick for both business and leisure travelers. The property is just 0,7km away from the city center, and it normally takes about 10 minutes to reach the airport. With its convenient location, the property offers easy access to the city's must-see destinations. At Mandila Beach Hotel DaNang, the excellent service and superior facilities make for an unforgettable stay. Guests can enjoy on-site features like free Wi-Fi in all rooms, 24-hour security, daily housekeeping, taxi service, ticket service. The property features 130 beautifully appointed guestrooms, many of which include closet, complimentary tea, towels, wooden/parqueted flooring, scale. The property's host of recreational offerings ensures you have plenty to do during your stay. Discover an engaging blend of professional service and a wide array of features at Mandila Beach Hotel DaNang. "The staff is really helpful and considerate." Children 6 - 11 years old will be charged VND 130,000 for breakfast when using existing bedding. Children under 6 years old stay for free with breakfast provided if using existing bedding. Dear Tienyun, Warmest greetings from Mandila Beach Hotel! Thank you so much for taking your time telling us how your stay was at Mandila Beach. It is wonderful to know that we served you a memorable stay, we are sorry about the outside noise made you feel uncomfortable. We believe that your fabulous review would be the great motivation for us to deliver the seamless service to our value guests. Once again, thank you so much for your feedback and we are looking forward to welcoming you again to the hotel. Thanks and best regards, The hotel management board. Dear Ng, Warmest greetings from Mandila Beach Hotel! We sincerely appreciate you spending time to share us such a wonderful review on Agoda which is the great inspiration for other guest to choose us as the dream getaway destination. Your feedback is great value to us and absolutely has been shared to the whole team especially Mr. Thuan Huynh – Our Front Office Supervisor and Ms. Khuong Nguyen – Our Guest Relation Officer. It is the great motivation for us to improve the quality of service every day. Once again, thank you so much for taking time to share us with your positive feedback. We hope that your family member has got well now and do look forward for having another chance to host your return at Mandila Beach hotel when visit Da Nang City soon. Thank you and best regards, The Hotel Management Board. Dear Sin, Warmest greetings from Mandila Beach Hotel! Thank you for taking the time to share your wonderful review on Agoda. We are thrilled that your visit was so great. We are so glad to be received review like yours, which is the great encouragement award for our team efforts making guests stay feel more comfort and memorable. Once again, thank you for your kindly review and we are looking forward to welcoming you again at the hotel! All the best for you! The hotel management board. Stayed here recently and overall had a pleasant stay. We had a suite with a balcony and it was great, lovely views and a great room. Two things I will mention, the pool was being renovated during our stay which I was not made aware of until one week before my stay which annoyed me. It ended up being ok since you're literally across the street from the beach and the views from our room were outstanding. The bathroom is set up in a way where taking a shower was cumbersome at best but we ended up taking baths in the huge bathtub which ended up being just what we needed. Dear Julio, Warmest greetings from Mandila Beach Hotel! Thank you so much for your time sharing us your experience on Agoda. It is our great pleasure to learn that your enjoyed our hotel, especially the Deluxe Ocean Front room, helpful staffs and room service... We are really sorry about the disadvantage on the bathroom design, which make you felt inconvenience. Recently, we are having some renovations on the top floor, we are really sorry about this issue. We are looking forward to welcoming you again to the hotel in the near future to enjoy a more enjoyable stay. Once again, thank you so much for your review and wish you all the best. The hotel management board. Good location, close to the beach and restaurant but a bit noisy at Saturday overnight since there is Primer league live that time. The room is clean, there is only a mirror inside the bathroom, suggest to add some mirror inside the room as convenience for lady' make up. Swimming pool at top floor is nice but a bit small. Dear Chan, Warmest greetings from Mandila Beach Hotel! Thank you so much for your time sharing us your experience on Agoda. We are happy that you had a pleasant stay with us and enjoyed our breakfast, clean room and swimming pool. We are really sorry about the noise from next door neighbor. Thanks for your suggest, we will take your opinion about adding mirror for consideration. We are looking forward to welcoming you again to the hotel! All the best for you The hotel management board. The hotel is very nice, great view of the Sea, room on front corner was a little noisy due to proximity to construction on adjacent property. They offered to change our room next day but we were fine after the first night. We had to take shower in the Bathtub as there was no shower head bracket and no curtain, but we manged for 4 nights. Good buffet breakfast. Staff is the best, from manager to desk and assistants, they couldn't do enough for us. Very friendly and explained where we could find food markets, durian fruit, and activities in DaNang. We took a fantastic river long boat ride to temple site with a young family who operated the boat and even cooked us lunch on board. People in Vietnam are very honest, friendly, interested and helpful to us tourists. Dear Wayne, Warmest greetings from Mandila Beach Hotel! We are thrilled to read your review and thank you very much for sharing your experience with us. We are happy to learn that we met your expectation and had a wonderful time with us. We are really sorry and hope for your sympathy about the construction noise which is out of our control. We truly hope to welcome you back at Mandila Beach Hotel in a near future!. Wish you all joyful Christmas and a New Year good health, happiness. Thank you and kind regards, The hotel management board. Near the beach. Clean place. It was a Great and Wonderful stay in this hotel. 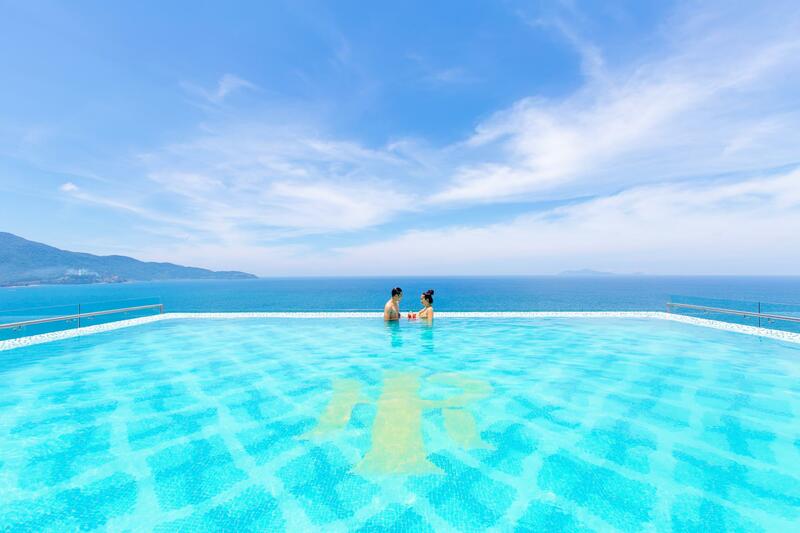 The infinity swimming pool with sea view makes me feel like stay a little longer there. The room is so big and with the bath tub. So nice and relax. I highly recommend this hotel! Dear Ms. Shirley, Warmest greetings from Mandila Beach Hotel! We sincerely appreciate you spending time to share us such a wonderful review which is the great inspiration for other guest to choose us as the dream gateaway destination. Your feedback is great value to us and absolutely has been shared to the whole team. It is the great motivation for us to improve the quality of service every day. Once again, thank you so much for taking time to share us with your positive feedback. We look forward to having another chance to host your return in Da Nang soon. Thank you and best regards, The Hotel Management Board. Dear Ms. Yuen, Warmest greetings from Mandila Beach Hotel! Thank you so much for your precious time sharing your experience with our hotel! We are really happy to learn that you had a brilliant stay with us and enjoyed our clean room, panorama beach view, delicious breakfast. Regarding to the construction view, please accept our apology for this inconvenience. We - Mandila team wish you all the best and looking forward to welcoming you again on near future. Have a nice day! The hotel management board. We booked two rooms at the hotel. Ours was a Sea facing deluxe room and I have to say the room met all of our expectations. The view of the sea was perfect. The room and balcony while small by our standards was well appointed. Breakfast was very good with plenty of options. The staff were very friendly and always smiling. This is a newer hotel and we hope they keep things up to the high standard that we observed. Thank you for a wonderful stay. Dear Mr. David, Warmest greetings from Mandila Beach Hotel! It is so pleased to read wonderful review like yours, thank you so much for your time sharing us your recent experience. It is always our great inspiration to make endless efforts to ensure our guests have a wonderful and memorable stay. We – Mandila team always feel so proud to receive such a kind–hearted review like yours. We look forward to having another chance to host your return in Da Nang soon. Thank you and best regards, The Hotel Management Board. We booked two rooms and we were in the Ocean View room. And... WHAT A VIEW!! The pool area was super nice as were the staff. Breakfast was very good with lots of selections. Overall, one of the nicest hotels of the trip. Dear Mr. David, Warmest greetings from Mandila Beach Hotel! It is so pleased to read wonderful review like yours, thank you so much for your time sharing us your recent experience. It is always our great inspiration to make endless efforts to ensure our guests have a wonderful and memorable stay. We – Mandila team always feel so proud to receive such a kind – hearted review like yours. We look forward to having another chance to host your return in Da Nang soon. Thank you and best regards, The Hotel Management Board. Great staff and facilities and next door to the beach! We loved the infinity pool with expansive view of Da nang. The buffet breakfast was fantastic. Staff was able to organise a scooter for rent too! Thank you! Dear Ms. Thuy-an, Warmest greetings from Mandila Beach Hotel! Thank you so much for spending you time writing us such a kind-hearted review on Agoda. It is wonderful to see your recognition of our service, we are proud that our team have strived to exceed our guest’s expectations. Feedback like yours truly motivates us to offer our best service possible. Once again, we sincerely appreciate you taking time to pass your review; it would give us joy and pride to serve you again. All the best for you The hotel management board. Beach is just cross the street. Dear Lin, Warmest greetings from Mandila Beach Hotel! Thank you so much for your time sharing us wonderful review on Agoda. We are happy to learn that you love your stay with us. In the future, if you plan to visit Danang again, please consider us as your first accommodation choice. All the best for you. The Hotel Management Board. Except the poolside bar is under construction, everything is good. We liked the breakfast. Room is clean n quiet, except Sunday night we can hear drum beats from outside until 2:30am. Dear Chihi, Warmest greetings from Mandila Beach Hotel! Thank you so much for your time sharing us your review on Agoda. We glad to know that you has wonderful stay at our hotel. How wonderful it was when we receive truly sincere feedbacks from your side and much appreciate for your recommendation to other guests about our hotel service. Last but not least, we -Mandila Beach entire team wish you all the best in lifetime and looking forward to welcome you back in next trip when visit to our beautiful Da Nang city. Best regards, The hotel management board. Breakfast is quite good. Room is spacious with a nice view of the beach and pretty big bathtub but the toilet would stink up and smell like urine at some time of the day. The table in the balcony is full of dust as well. Staff are helpful and responsive though. The poolside of the infinity pool is still under construction, which makes it not usable at day time during my visit. Could probably skip the rooftop bar as well since there’s nothing impressive. Around 10 minutes cab ride from the city and 20 minutes from airport. Dear Kong, Warmest greetings from Mandila Beach Hotel! Thank you so much for your time sharing us your experience on Agoda. We are happy that you overall enjoy your stay with us. We are sorry about the inconvenience that caused during your stay due to the renovation. We've worked with our team to check the toilet and the balcony table and make sure this problem will not happen again. We hope for your sympathy with this issue. We are looking forward to have another chance welcoming you again to our hotel! All the best for you The hotel management board. Everything is nice! The staff is really helpful and considerate. Seaside view of the swimming pool and breakfast are also great. I like they provide the shuttle bus to Hoi An which is much cheaper than using Grab to call taxi. Xin chào Alice, Warmest greetings from Mandila Beach Hotel! Thank you so much for your time sending us your feedback on Agoda as well as ranking us the highest score. We are so glad to be received review like yours, which is the great award for our team efforts making guest stay more and more memorable. We are looking forward to welcoming you back for another wonderful stay than previous one. The hotel management board. It has an incredible view of the beach located right in front of rows of restaurants both opposite of the road and also the same stretch and behind the hotel. Staff is very helpful and nice and recommend many good awesome food in Da Nang. It has an awesome view of infinity pool at the top. Dear Albert, Warmest greetings from Mandila Beach Hotel! What is a generous and wonderful feedback that create much spring to our guest to choose Mandila as the dream gateway destination. Your comments on the service provided by our staff are most gratifying and will be shared with the whole team to keep them motivated. Once again, thank you for sharing your experience, and we hope your next visit will be as pleasant as the previous one. Thank you and best regards, The Hotel Management Board. Dear Mr. John, First of all, We would like to express our gratefulness for your choosing our hotel and your feedback. We love to hear such terrific guest feedback, We are so happy to know how much you enjoyed your stay experience, especially the service we delivered. See you next trip in Da Nang at Mandila Beach hotel Sincerely, The hotel management board.